It has been a long way! We have announced our partnership with Coinomi, one of the trusted, safest and most well-known wallets in the crypto industry, where you can seamlessly swap between a wide range of listed cryptocurrencies right into the Coinomi app. We are more than happy to work together since September 2017! Since the launch in 2015, we gained trust of over 2M customers. Now Changelly supports more than 200+ altcoins and tokens available for exchange and buying for a bank card just in a few clicks. You can effortlessly exchange an unlimited amount in one transaction without dividing it into small parts. For your better experience, we have arranged a 24/7 support line for anyone who entrusts us with their funds. Coinomi is a security-first, SegWit-enabled, multi-asset wallet that provides native support and true ownership for 119 blockchains and 382 tokens for a total of 501 assets, available in 168 fiat currency representations and 25 languages. Coinomi is available for Android and iOS platforms, with desktop versions for Windows, Mac, and Linux coming soon. Founded in 2014, it’s the oldest and the most prominent multi-asset lightweight wallet with a clean, intuitive interface and hundreds of thousands of happy users, while at the same time no Coinomi wallet has ever been hacked or otherwise compromised. The wallet allows its users to swap coins for tokens and vice versa in just a few clicks directly from within the application with the use of a built-in exchange. Now it looks like this. 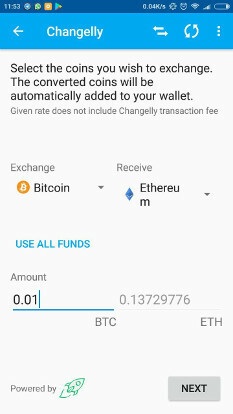 Changelly’s API is integrated directly into Coinomi’s interface and allows you to switch between currencies up to 50-200 BTC and even more. The whole exchange process algorithmically passes through Poloniex, Bittrex and other our trading partners to instantly determine the most competitive rates at the moment of exchange. Although Coinomi has another exchange on board already and they have chosen to integrate Changelly as well due to key advantage features. We provide the best rates for most of the trading pairs and support huge exchanges without limits, and offer a profitable revenue share model for Coinomi. For each successful transaction going through Changelly, Coinomi receives a percentage which is beneficial for both parties. We have various tools for merchants, blockchain services, ICO platforms to accept altcoin payments and bank cards for their tokens. Affiliate partners can integrate an “Exchange instantly” link or a customizable widget right into their websites. Changelly shares the revenue with partners for each exchange. 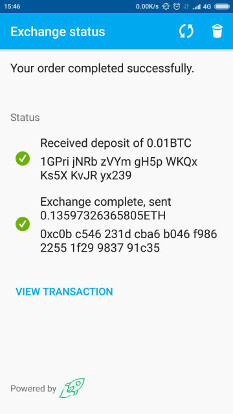 Changelly has already partnered with Jaxx, Exosus, Coinpayments, Freewallet, Coinmarketcap, Exodus, Mycelium, Coinpayments, official NEM/XEM wallet, Jerulida NXT wallet, ShakePay virtual card, Uquid debit card and other integrations are ongoing. Previous Post:How and when network fee is calculated?